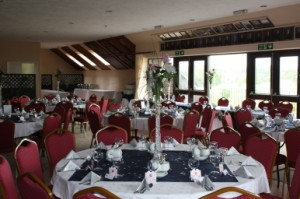 Aylesbury Vale Golf Club has its own purpose built Function Room which is available for hire and is ideal for hosting Weddings, Parties, Conferences or Meetings in a relaxed and spacious atmosphere. Seating up to 100, the Function Room is located on the first floor with a large balcony overlooking the golf course and stunning views of the surrounding countryside. There is ample free parking available in our car park. Your wedding day is a very important occasion and we will ensure that your day runs smoothly and will remain a treasured memory. Our experienced wedding co-ordinator will help with the planning of every detail of your special day including catering, wine list, flowers, decorations, photographer and music plus anything else that you may require. Full packages are available from the comprehensive wedding breakfast to meeting your every need right down to the buffet meal/pick-ups for the evening. We pride ourselves on our flexibility and every budget can be catered for. We are available 7 days a week, 364 days a year.